On March 3, a group of friends found a woman's decapitated body inside a sleeping bag on a 10-acre property on Camano Island. The remains were those of Katherine Cunningham, 26, who sheriff's detectives say was killed Feb. 15. Her boyfriend, first called a person of interest, is now a suspect in her death. 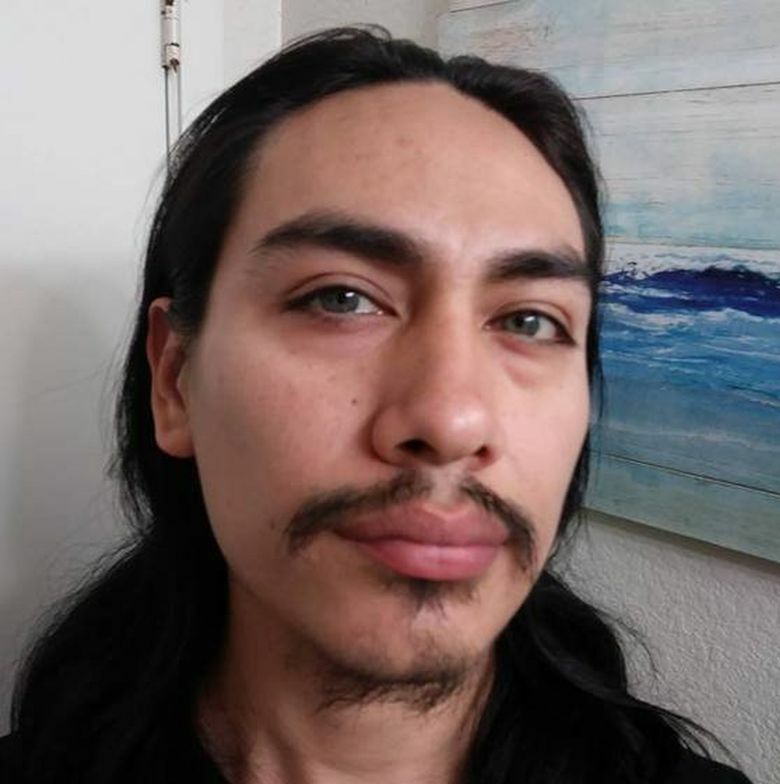 Nearly four months after Jacob Gonzales was named as a person of interest in his girlfriend’s homicide, Island County prosecutors charged the 33-year-old with second-degree murder after forensic testing found Gonzales’ DNA on the hilt of a samurai sword stained with the victim’s blood, charging papers say. A $1 million, nationwide warrant was issued Thursday for Gonzales, who allegedly fled Washington and abandoned his girlfriend’s car in Northern California on Feb. 16, a day or two after she is believed to have been killed on a 10-acre property on Camano Island, according to prosecutors. Nearly three weeks later, on March 3, a man interested in buying the 10-acre parcel off of Shady Lane went to walk the property with several friends, the charges say. Down a ravine, the group spotted a red wagon, tarps and other items that looked out of place, so they went to investigate. They discovered a sleeping bag wrapped in a tarp, and one man used his foot to push back the top of the sleeping bag. Inside the sleeping bag, the group found the decapitated body of a woman, who was later identified as Katherine Cunningham, 26. Detectives with the Island County Sheriff’s Office responded to the scene, and found a trail of empty sand bags that led from Cunningham’s body to a man-made bunker, which was dug six feet into the ground and reinforced with wooden walls. Inside the bunker, described as “the type used by survivalists,” detectives found two bolt-action rifles, a pump-action shotgun, a .22 caliber rifle with an altered stock and over 1,000 rounds of ammunition. “All of the weapons were loaded with rounds in their chambers,” according to the charges. Detectives also searched a travel trailer on the property and say they found a 9 mm handgun hidden inside a man’s hiking boot. Investigators learned the property had been leased to Gonzales and Cunningham. One of Cunningham’s cars was found parked at the scene, but a second vehicle – a silver 1998 Honda Civic – was missing, and it was entered into a police data base as a stolen vehicle. Police also searched two cell phones and a laptop computer belonging to Gonzales and Cunningham and say they determined there had been no activity on any of the devices since Feb. 15. Gonzales, who has a prior conviction in California for taking a motor vehicle without the owner’s consent and so is barred from possessing guns, was charged March 9 with five counts of second-degree unlawful possession of a firearm and a warrant was issued for his arrest, court records show. Three days later, detectives learned Cunningham’s silver Honda had been found abandoned on the side of Interstate 5 outside Yreka, Calif. on Feb. 16 and had been towed by the California Highway Patrol, charging papers say. “It should be noted that the vehicle was initially located and tagged almost two weeks before the homicide was reported in Island County, but only a day after we believe the homicide occurred based on evidence we located at the scene,” one detective wrote in charging papers. The California officer who impounded the vehicle found a medical card with Cunningham’s name on it in the passenger compartment, as well as a samurai sword, sheathed and wrapped in a blanket in the trunk, the charges say. Two sheriff’s deputies later went to California and drove the Honda back up to Island County. The sword and swabs taken from the Honda’s steering wheel were sent to the State Patrol Crime Lab for forensic testing, the charges say. The test results came back June 22 and showed that blood found on the sword’s blade matched Cunningham’s DNA, say charging papers. Male DNA found on the hilt’s cross guard was run through the FBI’s Combined DNA Index System (CODIS) and was matched to Gonzales. DNA on the steering wheel was matched to Cunningham and Gonzales, the papers say. On Thursday, prosecutors amended the original firearms charges against Gonzales, adding the second-degree murder charge along with theft of a motor vehicle, court records show.